This coloured lithograph is taken from plate 20 of Sir Charles D'Oyly's 'Views of Calcutta and its environs'. Chowringhee was once a suburb of Calcutta, and became one of the main European residential areas of the city. 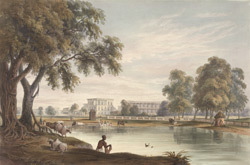 Its fine buildings and sweeping vistas impressed visitors and contributed to Calcutta's reputation for grandeur. This view is taken from across one of the three tanks (reservoirs) in the Chowringhee area. Now called Jawaharlal Nehru Road, this remains one of the main arteries of the city.